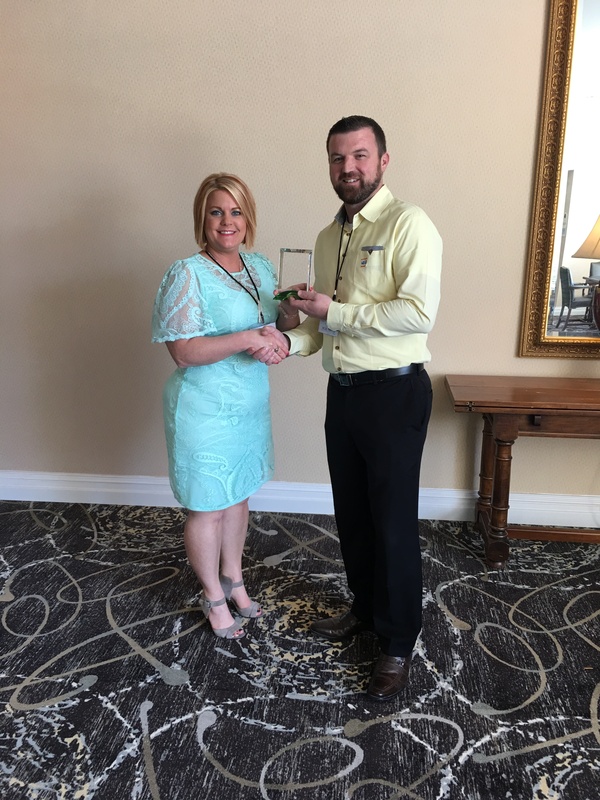 Topeka, Kan – LeadingAge Kansas recently recognized Patricia Raasch of Horton with a Chair’s Citation Award for Outstanding Advocacy at their recent Spring Convention and Expo. Raasch was awarded for her tireless work advocating for nursing home residents and their providers at the state and national level. The 2017 Chair’s Citation Award for Outstanding Advocacy is given out infrequently, at the pleasure of the Board Chair. “Over the past several months Patricia has been perhaps our most committed and busy advocate. She has given generously of her time, talent and treasure to speak out and speak up, not only for her own organization, but for all LeadingAge Kansas members and the people we serve and employ,” noted Nate Glendenning, LeadingAge Kansas Board Chair. Raasch has advocated on the impact of destructive CMS enforcement policies on quality of care, workforce, and the very survival of many small, rural nursing homes. She has met with Congresswoman Jenkins and staff, and Senator Roberts’ staff to tell her story and raise the alarm. She went to Washington, DC with other members of LeadingAge Kansas in March to reinforce the call for Centers for Medicare and Medicaid Services (CMS) reform with Congresswoman Jenkins, Congressman Marshall, Senator Roberts and Senator Moran. In addition, she attended a special meeting with new CMS Administrator Seema Verma. Raasch has also been actively working with LeadingAge Kansas to advocate for reforms in the state’s broken Medicaid eligibility determination system. She shared her story in a special meeting with Governor Brownback and his senior staff. She delivered testimony to the House Health and Human Services Committee, educating them on the true effects the backlog has had on nursing homes and their residents. Raasch volunteered as a charter member of the state-developed pilot project, created to re-vamp the failed eligibility process for nursing homes. “Patricia is a committed, effective and persistent advocate for all of us and the people we serve,” stated LeadingAge Kansas President and CEO Debra Zehr. Raasch is the Executive Director at Mission Village, a small, rural nursing home in Horton, Kansas. In her brief 3-year term, Raasch has revolutionized the organization and put a greater emphasis on the residents and staff. LeadingAge Kansas is an association of nearly 160 not-for-profit aging services providers dedicated to serving the needs of aging Kansans. We advance policies, promote practices and learning that empowers our members to help seniors live fully as they age. Our members serve over 25,000 seniors in Kansas each day. Learn more at www.leadingagekansas.org .